Faraday's laws of of electromagnetic induction explains the relationship between electric circuit and magnetic field. This law is the basic working principle of the most of the electrical motors, generators, transformers, inductors etc. Whenever a conductor is placed in a varying magnetic field an EMF gets induced across the conductor (called as induced emf), and if the conductor is a closed circuit then induced current flows through it. Faraday's second law of electromagnetic induction states that, the magnitude of induced emf is equal to the rate of change of flux linkages with the coil. The flux linkages is the product of number of turns andthe flux associated with the coil. Alternating current flowing in a coil produces alternating magnetic field around it. When two or more coils are magnetically linked to each other, then an alternating current flowing through one coil causes an induced emf across the other linked coils. This phenomenon is called as mutual induction. Lenz's law of electromagnetic induction states that, when an emf is induced according to Faraday's law, the polarity (direction) of that induced emf is such that it opposes the cause of its production. 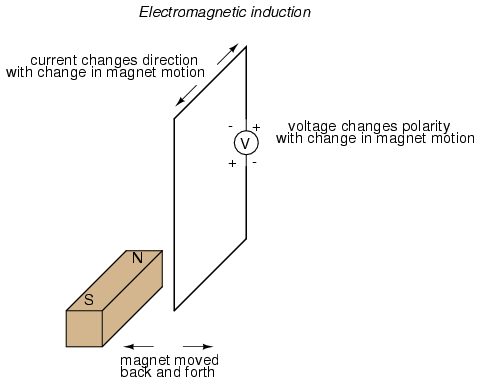 The negative sign shows that, the direction of the induced emf and the direction of change in magnetic fields have opposite signs.